If you had a brand new state-of-the-art telescope facility, what would you look at first? 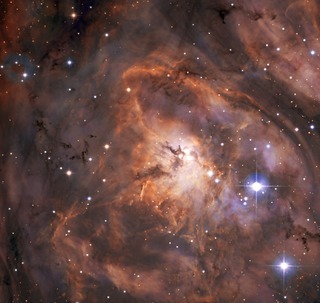 Researchers at the SPECULOOS Southern Observatory which comprises four small telescopes, each with a 1-metre primary mirror chose to view the Lagoon Nebula. This magnificent picture is the result, and is one of the SPECULOOS first ever observations. The nebula is a cloud of dust and gas in our galaxy where new stars are being born, and is found roughly 5000 light-years from us. This striking image is made even more impressive by the fact that the SPECULOOS isnt actually designed to study nebulae. The name says it all SPECULOOS, the Search for habitable Planets EClipsing ULtra-cOOl Stars. In other words, the primary mission of this telescope facility is to find Earth-like planets orbiting faint nearby stars. The candidates it discovers will be passed over to larger telescopes, such as ESOs forthcoming Extremely Large Telescope (ELT), to be studied in more detail. SPECULOOS is located at ESOs Paranal Observatory in the Atacama Desert of Chile, taking full advantage of the locations dark skies, ideal atmospheric conditions, and the support systems ESO has there, from telescope infrastructure to staff accommodation. It will have a partner, the SPECULOOS Northern Observatory, in the Canary Islands, which will hunt for planets in the northern skies not visible from Chile. Together they promise to vastly expand our knowledge of the exoplanets in our neighbourhood.